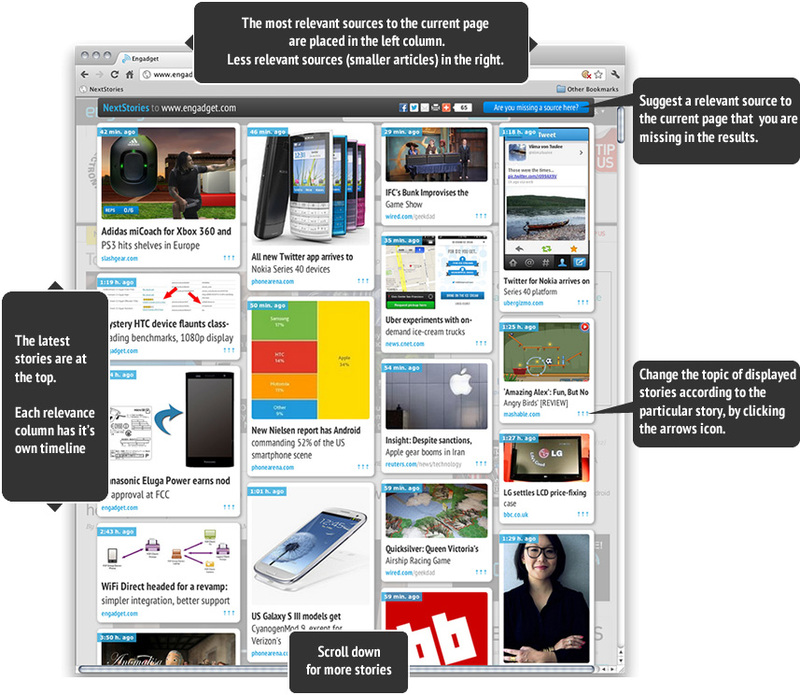 Click on the NextStories bookmarklet while viewing a news site or blog. A preview of the latest articles from related sites will then overlay the page, so that you can easily choose which story to read next. What makes NextStories so unique? NextStories offers you never-ending reading on your favorite topics. When you’ve finished reading a particular story and then start thinking about which site or article to go to next, click on the NextStories bookmarklet. NextStories will then show you the latest articles from similar sites to the page you are currently on. The recommended reading is displayed in a grid layout overlaying the current page. The articles are separated into columns and each column represents a certain level of relevance, sorted from the most relevant on left to less relevant (and smaller) on the right. So, depending on how you feel, you can stay close to the current topic or leave for a new one. Each column has its own timeline, so you can choose from the most up-to-date stories at the top or scroll down for more, less recent stories. At the same time, it also automatically offers relevant content from other sites although the relevance may be lower. However, the more people who start using NextStories, the more sites it becomes automatically optimized for and thus the quality and relevance of sources offered is continually improving. So, please check back regularly to see how we’re coming along.